Waterloo – Wilfrid Laurier University’s quartet-in-residence, the Penderecki String Quartet (PSQ), is celebrating its 25th anniversary at Laurier with a series of events, including a special performance on March 19 featuring pianist Janina Fialkowska and works by Chopin, Schumann and a commissioned anniversary work by Ottawa composer Kelly-Marie Murphy. The full program is listed here. Formed in 1986, PSQ began as winners of the Penderecki Prize at the National Chamber Music Competition in Łódź, Poland. 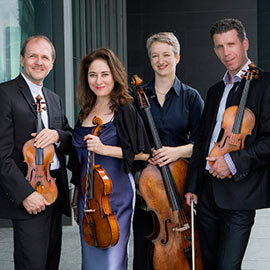 The quartet, which currently includes Jerzy Kaplanek (violin), Jeremy Bell (violin), Christine Vlajk (viola) and Katie Schlaikjer (cello), has performed, recorded and travelled the world — earning the reputation of being one of the most celebrated chamber ensembles of their generation. Since 1991, PSQ has been based in Waterloo, as Laurier’s quartet-in-residence. Members of the quartet continue to be active members of the Faculty of Music. The quartet is dedicated to the education of Laurier music students and has been essential in building the string program to be one of the top programs in Canada. The PSQ 25th anniversary concert, featuring Laurier honorary doctorate recipient and concert pianist Janina Fialkowska, takes place March 19 in the Maureen Forrester Recital Hall on Laurier’s Waterloo campus. Doors open at 2 p.m., and the event starts at 3 p.m. Tickets are available for purchase through Ticket Scene. Fialkowska has performed worldwide under the baton of such conductors as Zubin Mehta, Bernard Haitink, Lorin Maazel, Sir Georg Solti, Sir Roger Norrington and Yannick Nézet-Séguin. She began her piano studies at four years old, and has worked in her native Montreal with Yvonne Hubert, in Paris with Yvonne Lefébure, and in New York at the Juilliard School with Sascha Gorodnitzki. She has received several honours, including the Order of Canada, the Governor General’s 2012 Lifetime Achievement Award in Classical Music, and three honorary doctorates. In addition to releasing over three dozen recordings and premiering 100 new works from composers in Canada and abroad, members of the PSQ have recently been guests at Indiana University, the Beijing Conservatory, the University of Southern California and the University of British Columbia. The quartet’s international performing schedule has included appearances in New York, Amsterdam, Hong Kong, Los Angeles, St. Petersburg, New Zealand, and throughout Europe in Rome, Madrid, Paris, Belgrade, Prague, Kraków, Vilnius and Zagreb. The PSQ has also toured extensively in Mexico, Venezuela and Brazil and from coast to coast in Canada. In addition to the event on March 19, the PSQ will be presenting the 25th edition of QuartetFest2017, an international chamber music festival that takes place May 26 – June 11.